What happens when greenhouse gas-driven climate change arouses an unwanted set of responses from the Earth’s natural systems? 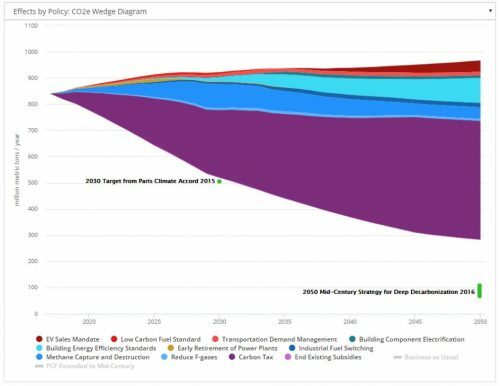 Can self-reinforcing feedbacks in the Earth system activated by climate change mean overshooting the 2°C international goal for global average temperature, even if emissions are restricted to desired levels? Feedbacks are the cyclical processes in a system, where one set of factors drives another set, which in turn drives the first. By repeating this cycle, a system such as the Earth’s climate can be taken to a new state. Feedbacks in the Earth system unfold over many different timescales. One example of a self-reinforcing feedback is sea ice loss in the Arctic summer. The loss of sea ice that normally blankets the Arctic Ocean with a highly reflective whiteness — when diminished by warm air and ocean temperatures– can cause some of the bright ice covering to melt, revealing a dark ocean. A dark ocean absorbs the sun’s energy, further warming the ocean and exacerbating the loss of more sea-ice, resulting in record low amounts of summer sea ice. This reduction in Arctic sea ice amplifies the greenhouse gas-driven increase in warming already occurring. These self-reinforcing feedbacks have an important role to play in our understanding of how the Earth responds to excessive greenhouse gas emissions. Here we summarize research on feedbacks in the Earth System based on analysis of past climates, current understanding of feedbacks, and modeled representation of the role these natural feedbacks may play in amplifying or dampening human-driven climate change (Steffen et al 2018). This work explores the magnitude of change caused by amplifying feedbacks (i.e. positive feedbacks) and how they can they drive the climate beyond a threshold into a very different state, a “Hothouse Earth”. 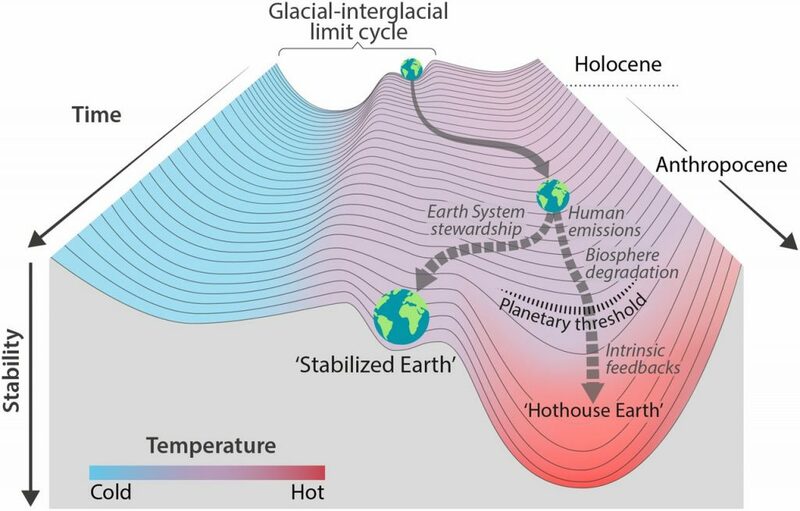 “…we cannot exclude the risk that a cascade of feedbacks could push the Earth System irreversibly onto a ‘Hothouse Earth’ Pathway” (Steffen et al 2018). Current warming, of approximately 1°C above pre-industrial global average temperature brings the Earth near the upper temperature bound of past interglacial periods of the last 1.2 million years. If present emissions trends continue, the average temperature this century is likely to exceed 2°C, but scientists don’t precisely know the threshold beyond which a cascade of feedbacks would be unleashed and become difficult to arrest. The implication of this work is that humanity, due primarily to fossil fuel emissions, has already placed the Earth system near this dangerous threshold. In the following figure from Steffen, the natural oscillation of the Earth between glacial and interglacial modes shown at the top of the diagram is nudged out of that pattern by emissions of the industrial age into a new pattern. The new pattern, indicated in the figure as the Anthropocene, leads to a Hothouse Earth unless measures are taken to stabilize the system curtailing the cascade of feedbacks currently being set in motion. The desired state is indicated as a “Stabilized Earth” requiring massive intervention in humanity’s energy and land use systems from present practices. Fundamental research is needed to further identify the relevant amplifying and dampening feedbacks, characterize their mechanisms and rates, and quantify their effects. Dampening feedbacks (i.e., negative feedbacks) include the ability of the ocean and land to take-up carbon from the atmosphere. These dampening feedbacks have shown a diminishing capacity to continue this function as concentrations in the atmosphere continue to rise. The authors contend that moving off the Hothouse Earth trajectory requires rapid and deep cuts in greenhouse gas emissions, thereby halting the growth in atmospheric concentration of carbon dioxide. Other strategies include the removal of carbon dioxide biologically through protection and enhancement of land area in forest, and possibly the need for technology-based direct removal of carbon dioxide (direct air capture). Blocking a fraction of the incoming solar radiation via radiation management (a type of geoengineering) may also be needed. Taken together, these strategies may be required to keep the system out of the danger zone while restorative strategies take root. As none of these restorative strategies is at scale, temperatures will likely continue to rise toward the theoretical threshold of 2°C. If temperatures are allowed to go beyond 2°C, it may become very difficult to counter the cascade of feedbacks described in this research and avoid the Hothouse Earth. The following table (Steffen 2018) characterizes the magnitude of Earth system carbon cycle feedbacks and their relative strength represented as an estimated additional increase in global average temperature by 2100 assuming the Paris goal of 2°C is realized. This amounts to an additionality due to these carbon cycle feedbacks of about 0.5°C. The feedback strength indicated by 2100 in the above table is not an endpoint. Some feedbacks such as permafrost thawing or release of methane from the continental shelf (not included in the table) may have significant impact on global average temperatures in subsequent centuries to millennia. The 2°C threshold is not known with certainty and more research will better describe the Earth’s tipping points and feedback mechanisms. However, the authors contend that enough is known to take seriously the implications of their work. Other lines of recent research (e.g. Fisher et al 2018) explore what can be learned from climates of the past, when the Earth was much warmer than today, with high sea-level and other major differences from the Earth of today. However, the climates of the past that occurred naturally are not perfect analogs for what is happening now during the Anthropocene. This paper by Steffen and colleagues points to the uncomfortable reality that humanity is facing a crossroads – our choices of the next decades may affect conditions on Earth for millennia – choices that move us toward a sustainable system not too different than today’s climate and biosphere or a vastly different Hothouse Earth. Steffen, W., et al. (2018). “Trajectories of the Earth System in the Anthropocene.” Proceedings of the National Academy of Sciences. Fischer, H., et al. (2018). “Palaeoclimate constraints on the impact of 2 °C anthropogenic warming and beyond.” Nature Geoscience 11(7): 474-485.